I nearly forgot to review this book. I try pretty hard to keep all my review copies in one place but Dinosaur Zoom! disappeared from my pile the day it arrived and has been living in Wild Man's room ever since! 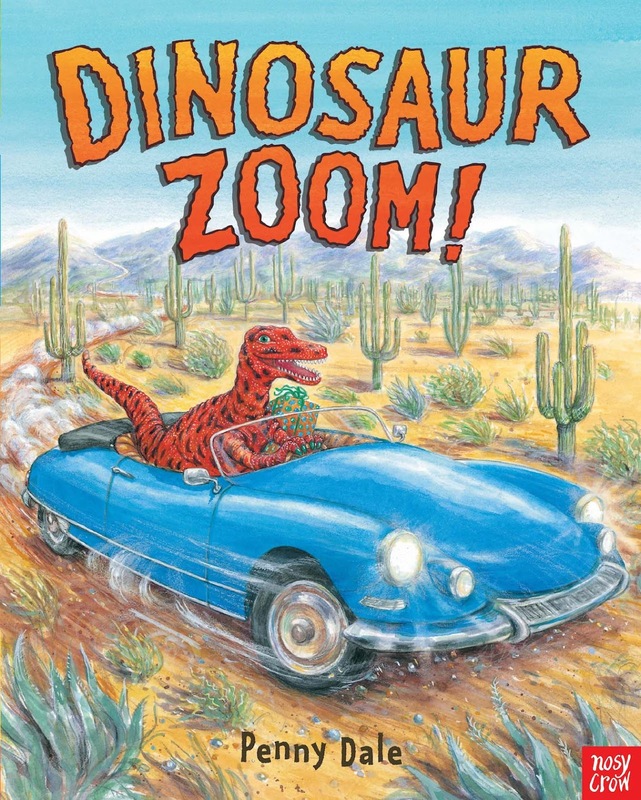 When I first read Dinosaur Zoom! 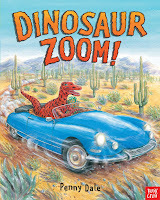 by Penny Dale I thought it was a little bit simple because it doesn't call the dinosaurs by name in the text of the book (although there are pictures and names of the dinosaurs on the front end papers, and pictures and names of the cars they drive on the back end papers) but I was wrong. Wild Man loves this book. We have read it over and over and over again and he still loves it and requests it often. The first half of the book is about different dinosaurs, driving different vehicles, racing to get somewhere. There is a definitely sense of anticipation about where they are going and why they are racing, plus there are lots of cars and dinosaurs to look at ... little boy heaven. Then the dinosaurs all arrive at a picnic place in the forest and it turns out they are organising a surprise birthday party. We yell out 'surprise' at the appropriate moment and Wild Man reacts to this part as though the surprise party was for him. It's all very exciting and we spend ages talking about the the detail of the pictures - what might be in the box on the back of the tractor, what party food we would eat first if we were there, which is the best present and so much more. It is the illustrations that make this such a fantastic book for little people, particularly dinosaur and car mad little boys. They are bright, clear and friendly, filled with action, detail and excitement. The story is also good - simple and clear - with lots of repetition of words which kids tend to love. All in all, this one is a winner. I can't imagine that there is a little boy alive who wouldn't love it. A board book edition will be published early next year, which would be a perfect present for any tiny little man. Very exciting! Who'll love this: Boys aged two to four.